You are here: > Home > Blog > How Long Do UPS Batteries Backup For? How Long Do UPS Batteries Backup For? When you buy an uninterruptible power supply you expect to it to provide a certain amount of battery runtime over its lifetime. The amount of runtime a UPS system can provide is dependent upon a number of factors. Let’s consider a 30kVA UPS system protecting a typical comms room and critical power installation. The UPS has an internal battery providing 20mintues runtime at full load. On day one we expect the UPS system to provide 20minutes backup power once the battery set has fully charged. However, some battery sets need to ‘mature’ and be cycled a couple of times to reach their full runtime capacity. If the UPS is subject to witness load testing, it may be necessary to cycle the battery a couple of times using a temporary load bank for the discharge tests until the battery comes up to full capacity and can deliver the full 20minutes runtime at full load. This assumes a 100% loaded UPS system on day one. Next we consider the actual load size on the UPS itself. Uninterruptible power supplies can support a wide load range and this will typically be anywhere from 25-100%. Within this range most modern UPS now achieve high operating efficiencies but the optimum load profile is still 80-90% rather than being fully loaded. The amount of back-up time available is a calculation of the overall Ah-capacity of the battery set and the load% applied. At full load we should see 20minutes at 30kVA and say 40minutes at 50% load or 60kVA. It is always useful to check with the UPS manufacturer at what load level they have specified their battery runtime. Even though the UPS may be rated as a 30kVA system, the battery runtime may be subject to small print denoting an 80% load assumption i.e. the UPS is 30kVA but the runtime is 20minutes at 24kVA not 30kVA. It’s also important to note that battery runtime is typically quoted as a ‘day one’ value. If you require a guaranteed runtime at year five or year ten then the battery has to be oversized at the initial installation. Room ambient temperature can also affect battery performance. 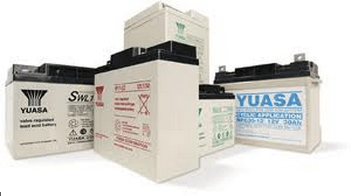 Most UPS batteries are of the Valve Regulated Lead Acid (VRLA) maintenance free type and have a five or ten year design life. They are designed to provide their optimum working life within a 20-25degrees Centigrade environment. As a room temperature rises, the runtime increased but design life reduces. The guide is that for every one-degree rise above 30degress Centigrade, a battery’s design life will halve. Battery age can also affect the runtime available from a UPS battery. Most VRLA batteries are designed to provide 300-400 complete charge/discharge cycles. As batteries age they can suffer from sulfation and a rising internal impedance. These battery ‘hardening’ issues can reduce or limit the flow of electrons between the plates and result in less energy being available. Furthermore, a weakening battery can drag down the overall electrical performance of a complete battery string or set. In terms of battery warranty, UPS manufacturers back-to-back battery warranty to their battery supplier. They may provide a one or two year warranty with full replacement if required or a pro-rata warranty with say 90% in year 2, 80% in year 3 and so on. What’s important to note is the overall life of the battery. A five-year design life battery will require replacement during years 3-4 of installation and a ten-year design life battery during years 7-8. Whilst most UPS systems incorporate some form of battery testing, for larger critical three phase UPS installations we always recommend adding an annual battery testing to a UPS maintenance program and where necessary full on-site battery monitoring. Finally the larger the UPS installation the more planning will have to be given to the logistics and project management should you need to purchase replacement UPS batteries.